Both candidates for Governor want college to be more affordable and accessible for students, but they have different ideas of how to achieve it. Most importantly to Mason students, both candidates want to stabilize college tuition prices. Democratic candidate Ralph Northam suggests using what he calls the “four year promise,” which guarantees that tuition costs will not change for a student’s four years of undergraduate education, but tuition prices would start out slightly higher to account for the fluctuating price. The College of William & Mary has already implemented a similar program. According to the State Council of Higher Education for Virginia, more than 80 percent of students there graduate within four years, which is much higher than the statewide average and over double the rate at Mason. Meanwhile, Republican candidate Ed Gillespie supports a state savings account that schools can rely on during tough budget years. Virginia already has a general fund in place that Richmond lawmakers can pull money out to use for any state agency, including education. Though a similar college-specific account has been on the table before, Virginia lawmakers have never voted to fund it. Taking a broad look at Northam and Gillespie’s other plans for higher education, there are both differences and similarities between the two candidates. Northam’s idea for revamping higher education in Virginia is broken down into three ideas: affordability, accessibility and innovation. 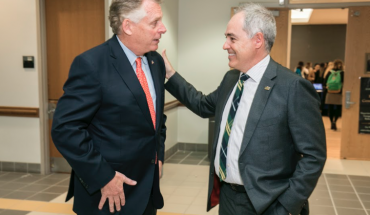 He supports increasing access to online learning and open educational resources like Mason’s current partnership with Online Virginia, which helps Virginians complete their degrees through a simplified process. He also wants universities to partner with private businesses to attract top students and entrepreneurs. 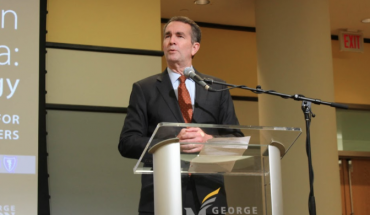 Virginia is ranked 8th in the country for degree attainment, but Northam hopes to expand that in part with innovation. Gillespie’s education plan seeks to make Virginia the “Opportunity Capital” of the nation by stressing three types of strategic partnerships. The first is a business-education partnership that would focus on workforce development. The second is a partnership between the Commonwealth and Virginia colleges to make higher education more accessible and affordable. The third is a consumer partnership between universities and the students they serve. Gillespie proposes that these three partnerships will make college more accessible and affordable to Virginians. Both Gillespie and Northam have different education plans with similar goals; both want to lower college tuition, make higher education more accessible, and increase innovation and economic development at the college level. Virginia voters will get to choose with their ballot which candidate’s education policies they prefer on election day, Nov. 7.